Last week was full-on summer. Hot, sweaty temperatures outside so that meant we turned on our fans, went on a lot of evening bike rides and hung out on the balcony to drink beers. Not too shabby, mid-September! But this morning was a different story. Outside our window, the mountains disappeared into the fog and we closed our windows because of the chill. It was the nudge I needed to get me into the kitchen. 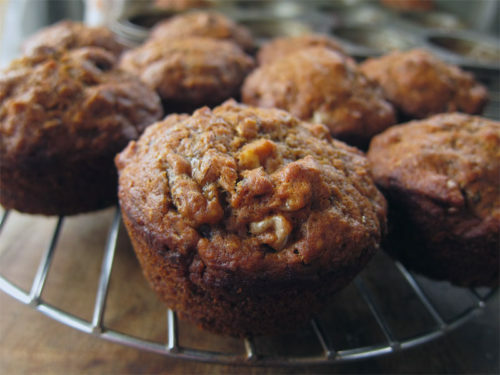 As soon as I drank my morning coffee, I was off to make a gingerbread granola and a batch of these delicious muffins. 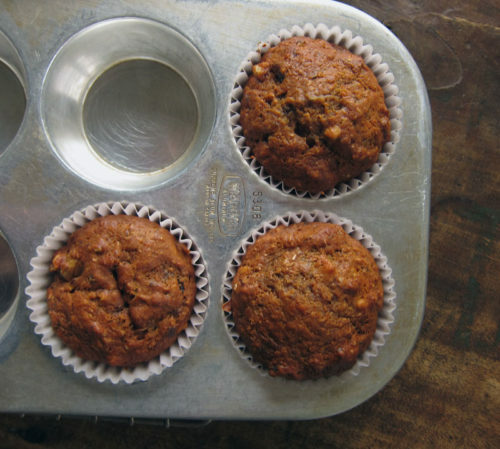 I was looking for a vegan muffin since we have some guests staying with us from the UK and the recipe from Gwyneth Paltrow’s new cookbook seemed promising. Lucky for all of us, it was. The recipe calls for gluten-free flour, but I just used all purpose since it was the only flour I had on-hand. I decided to bump up the nutritional value with some wheat bran tossed in. It worked out well. Maple syrup and dates sweeten the recipe – but dang it, I only had half the amount of maple syrup (the real stuff here) so I made up the rest with molasseses. And let’s face it, I upped the date factor to about 3/4 of a cup worth because dates are good. And maybe because of all my playing around, I found the muffins a bit sweet – next time I’ll cut the sweetener by a quarter cup or so. So, next time you’ve got a hankering for a delicious morning muffin – something to stave off the autumn chill, make a batch of these. An ideal way to enjoy a foggy weekend morning. In a large bowl, whisk together the flour, wheat bran (if using), baking powder, baking soda and sea salt together. In another large bowl, combine the bananas, oil, maple syrup, molasses, almond milk and vanilla together. Add in almost all but 1/4 cup of the flour mixture and blend slowly. Add the chopped walnuts and dates into the remaining flour mixture and toss until everything is coated. Pour into the batter and blend until just mixed. Grease muffin tins and dollop batter into tins, 3/4’s full. Bake for 18 minutes, or a bit longer if using bigger muffin tins. Test with a bamboo skewer to check doneness. Tops will be golden brown. Makes about 15 regular sized muffins and probably 12 large ones. Those look like perfect muffins for a cloudy cool day! Goodness, there is so much goodness in these! Mmm. That was a sudden change of weather wasn’t it? I thought we had one more day of sun. Perfect day to bake some muffins! This recipe sounds delish. Chilly, fall days are perfect for baking! But yes, the weather did change pretty quickly! 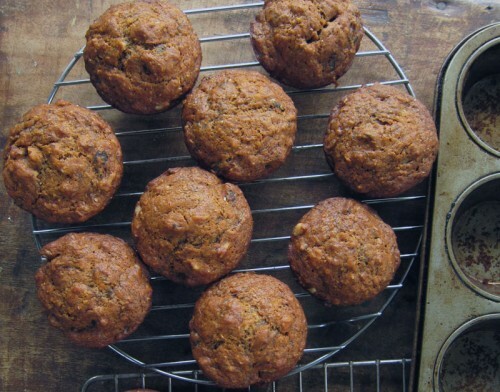 I love the dates in these muffins. They add such a great natural sweetness. Fall is very much making it’s presence known in the UK at the moment so these muffins would be so good right now! I love the idea of using dates, I bet they add great moisture as well as sweetness. Yum! I love fall, and this looks like the perfect fall breakfast. Fall kinda snuck up on us here in Toronto — one day is was hot, hazy and humid, and the next, crisp and chilly. I love a bit of weekend baking. Thanks for the recipe! Foggy weekend mornings. In Vancouver. Sigh. They look great! The cool weather hit is pretty quickly here in Michigan, too. As much as I’m going to miss summer, I am looking forward to cozy fires and spiced baked treats! I thought so too, Hag. It’s a good recipe and nice to see you blogging again! Thanks Joanne, the dates do add a nice sweetness. Caz, most definitely – and bring on fall!! Julie, I’m sure foggy mornings in Tofino are even better! I’m still dreaming of your holiday photos!! Oh no, Mandy! Sorry about that. I’ve fixed the temperature and I hope they turned out okay. We are well into chilly mornings and nights in Toronto. Made these last night – so easy and so good. Its hard to believe these are so healthy. Great breakfast! 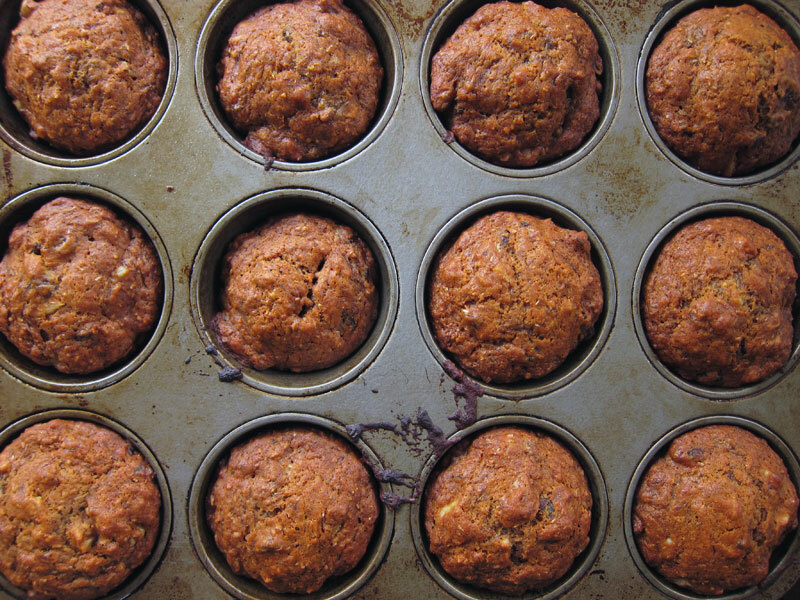 Love the sound of these muffins! Hearty and healthy and tasty. I have some dates that I need to use up so maybe on my next day off, if I’m not out running errands and catching up with people, I do some autumn baking. I’ll also be sharing this recipe with my s-i-l who is vegan. Bijoux, thanks for sharing! I hope your job is going well and that you’re enjoying it! Even if it means baking for fun gets done a little less often now. Thanks for putting up this recipe. I was a bit hesitate about using molasses but the molasses flavour wasn’t too strong at the end. I will probably try all maple syrup next time. I will also probably used pecan nuts next time. Thanks la_rahh, glad you enjoyed these! Great recipe! I made a streusel for the top, brown sugar, olive oil, oatmel cinnamon and ground almonds. Yummy!